I love to shop! I mean clearly, I love it so much that I opened my own online clothing store, Murph Boutique! I also love finding the best deals out there. I’m always searching for the best bang for my buck! I know there are plenty of other ladies out there just like me, and that’s why I made it my mission to make sure Murph carries affordable clothes that women will want to buy! 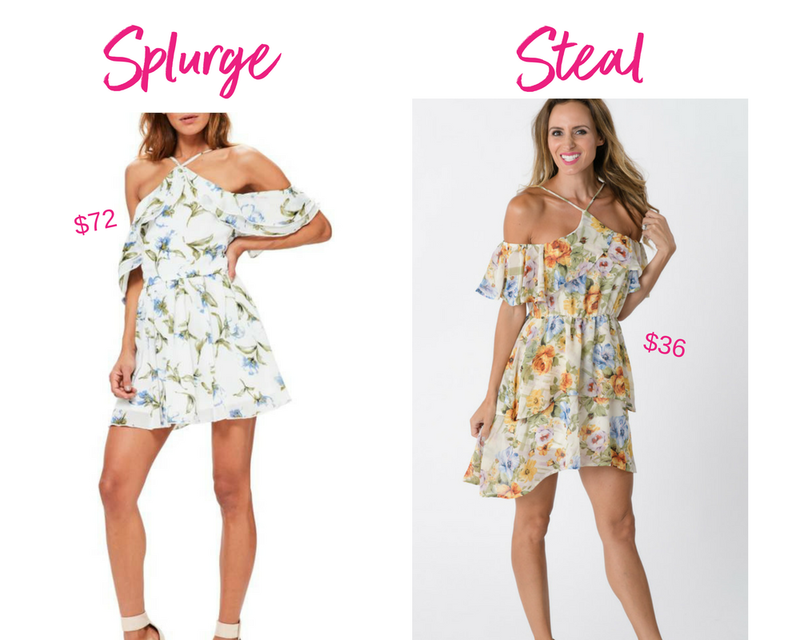 So, as I’ve been searching around doing some online shopping, I’ve found many clothes that are very similar to the clothes we have at Murph for more than double the price that we sell them for! I love it when my outfit reflects something high-end, but I actually got it for a steal! Almost everything we sell at Murph is under $50, so if you are on a budget or are just looking to save some of that spending money, head over and see what we have for you! First, we have this beautiful Mixed Stripe Midi Skirt on our model Brooke. I found a similar skirt at Neiman Marcus for $126 (and that’s the sale price! ), but we sell ours for only $46! 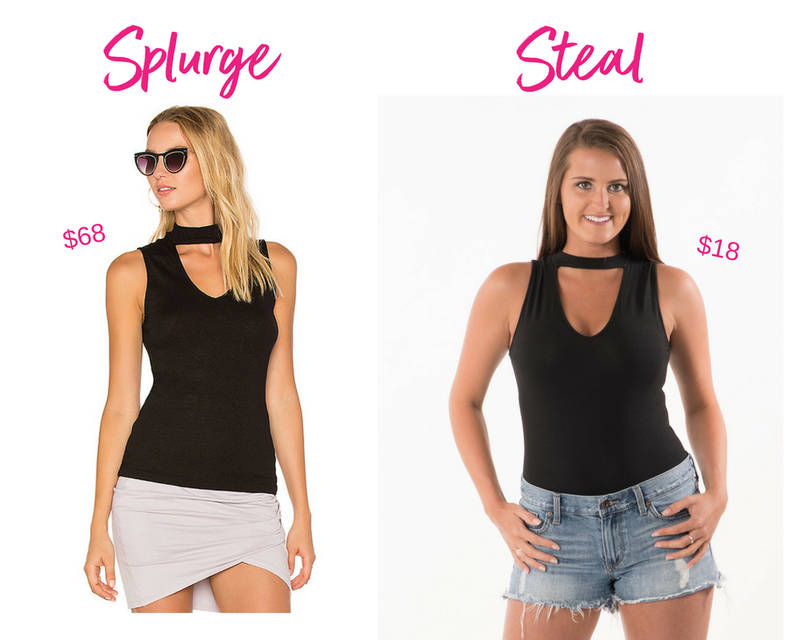 I found a similar tank top like the bodysuit she’s wearing on Revolve for $68… Well our Choker Neck Bodysuit is only $18! Seriously, you can’t get much better than that. One of my new favorite dresses at Murph is this Floral Tiered Ruffle Dress. I love the material of this dress because it is light and flowy! I found this one at Nordstrom very similar to the one we have at Murph, but ours is literally half the price! Shirt dresses are easy and fun! But there is no need to pay an arm and a leg for one. 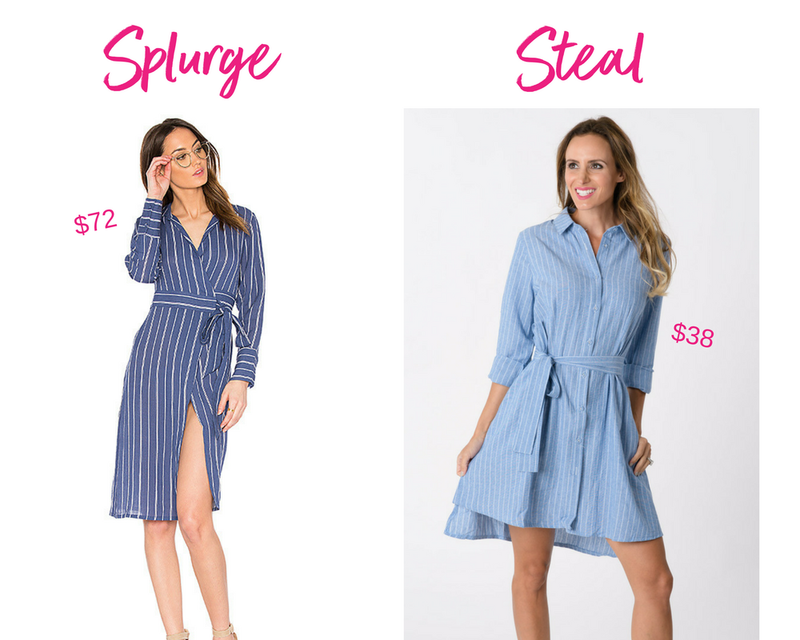 So, instead of paying $155 for a shirt dress like this one from Revolve, we sell our Stripe Chambray Shirt Dress for $38! Maxi’s will never go out of style! And right now bright colored off-the-shoulder dresses are everywhere! 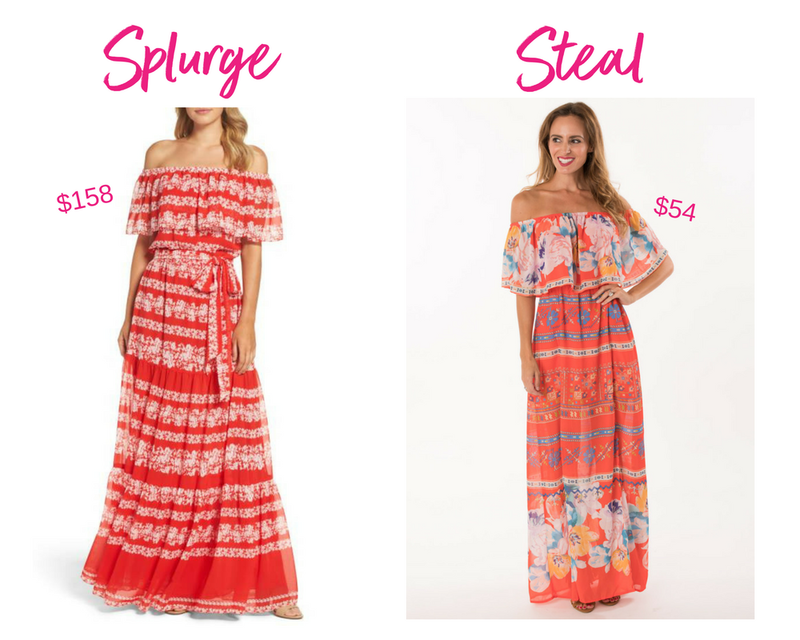 Maxi dresses can definitely cost more than a shorter dress, but there’s no need to splurge too much on a maxi when you can find it for a steal! Places like Nordstrom carry maxi’s like this one for $158, but I love our Off-Shoulder Mixed Pattern Maxi that is perfect for the summer and it’s only $54! Speaking of off-shoulder, I am obsessed with our off-shoulder Flounce Bodysuit! I recently found one similar to ours for $169 (marked down from $250) – but why spend that much money when you could get ours for only $18? It is so soft and cute, this is a steal for sure! And we cant forget one of the most important parts of an outfit… shoes! Cute shoes can make or break an outfit, but sometimes they’re not worth spending a lot of money on! At Murph we have the CUTEST pair of Denim Slip-Ons. 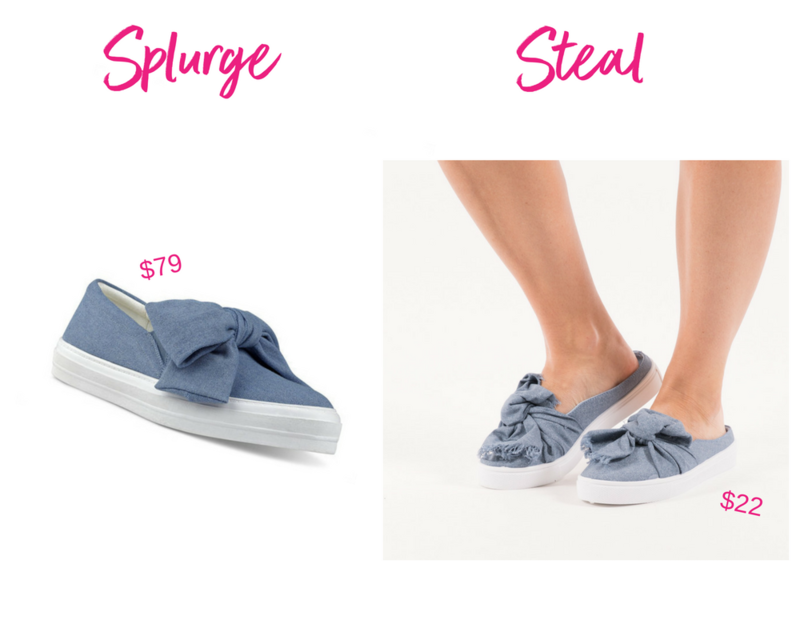 They are perfect for just throwing on to run errands or a casual day in the sun. Denim is very trendy right now and I found a perfect match to our denim shoes at Nine West for $79. Well, ours are on sale for $22! A STEAL! Oh, and those Ball Drop Earrings? Yeah, I saw them on BaubleBar for $48 – or you can find them at Murph for $14! And just one more pair of earrings I saw while I was browsing BaubleBar … Our Crystal Drop Earrings are gorgeous and such a steal at only $16. These similar earrings are $36 at BaubleBar! Head over to ShopMurph.com and take a look around, we have something for everyone! 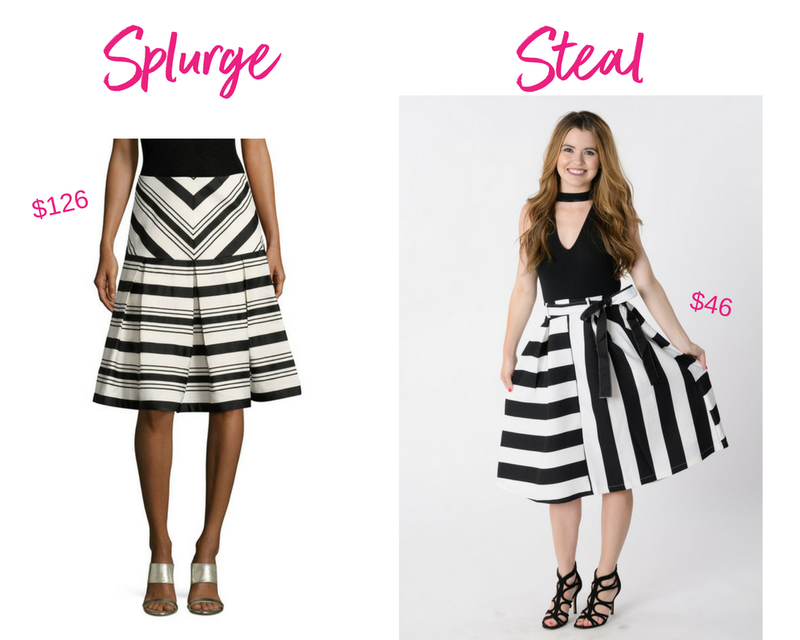 There’s no need to splurge on clothes when you can find them for a steal!